﻿ On Apr. 17, 2012 the Taipei Customs Office seized around 1,300 grams of ketamine concealed inside Chinese medicine capsular. On Apr. 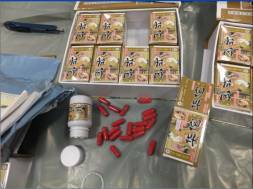 17, 2012 the Taipei Customs Office seized around 1,300 grams of ketamine concealed inside Chinese medicine capsular.